R.R. Marshall: Steve, I have to admit being a little out of my element as I’ve never conducted an interview for a World Championship team before! What else can be said after a last second, 20-17 win over the St. Louis Rams in Super Bowl XXXVI but, Wow!? Steve Grogan: I think wow is the operative word, and don’t worry about not having ever done an interview for a championship team, I’ve never given one either! We talked last week about this Patriots’ team having a chance to win if they played a perfect game, and in my estimation they played as near a perfect game as anybody could play. It doesn’t happen very often, but it happened in New Orleans on Sunday night and they walk away as World Champions. RRM: The Patriots must have raised a lot of eyebrows across the country when they came out for the pregame introductions and insisted on being announced as a team, rather than individually. It turned out to be quite an omen and an appropriate gesture? SG: That really was an attention-getter for this team. They had been doing that all year and it surprised me because I was wondering whether the NFL would allow them to do that. That’s just never been done, where the entire team is introduced together. Apparently Bill Belichick talked the league into letting then do it that way and it’s kind of representative of the way these guys have played all year. We’ve said it all before, there are no great superstars on this club, just a bunch of guys playing well as a team. Being introduced as a team served as a rallying point for them, and they just went on from there. RRM: A look at the statistics shows an eerie similarity to the first game between the two clubs back in November. The Rams offensive numbers are almost the same and they held the ball for about the same amount of time, but this time the Patriots did not turn the ball over. Was that the difference in this second meeting between the two clubs? SG: The Rams had 400 yards of total offense just like last time, and if you just looked at the statistics without having watched the game you would think the Rams had blown them out. They had a whole lot of yardage and won the battle of time of possession, but the Patriots defense kept giving, giving, and giving until the Rams would make a mistake and they would shut them down. The whole difference in the game this time around was the turnovers. The Patriots forced three Rams’ turnovers, and it’s not like Kurt Warner decided to put the ball up for grabs or just drop the ball. Those weren’t unforced errors, the turnovers came because guys were constantly in his face and there were other Patriots’ players anticipating where the ball was going. On offense the Patriots played such a clean game, I can’t think of a situation where they even came close to turning the ball over. In that first meeting they turned the ball over three times, and holding onto the ball in this game was a major factor for coming away with the win. RRM: Everyone wondered if the hard-hitting New England defense could slow down the high-flying Rams offense, and as it turned out St. Louis buckled just enough to keep them out of the endzone until the fourth quarter? SG: The Patriots defense was very physical in this game right from the beginning. They were really popping the Rams’ receivers before, after, and during catches. They were getting after Marshall Faulk when he tried to run the ball. It didn’t look to me like they did a lot of things that were overly confusing on defense but because of their physical play they just took the Rams out of their game and they couldn’t develop a rhythm. The hard-hitting the Patriots were doing definitely intimidates a team. You make that first catch and you get popped with your head slamming into the turf, and all of sudden you’re not thinking as clearly. The next time you go across the middle looking to make a catch you have one corner of your eye looking to see where that hit will be coming from. It really takes you out of your game. RRM: The Patriots employed a lot of five, six, and seven defensive back-schemes against the Rams, chosing not to blitz Kurt Warner as much in this game. What did you think of the strategy? SG: In that first game against the Rams the Patriots blitzed some 35 or more times, and they had played well in that game. I’m sure the Rams felt like they would see a lot of blitzing from the Patriots, but what they mostly did was back off and let them throw the ball and then have a couple of guys around to either the knock the ball or receiver down. I think that confused the Rams quite a bit, so it was quite effective. RRM: You lived here long enough to know how New Englanders think. When Tebucky’s Jones long fumble recovery run was wiped out by a holding penalty in the fourth quarter with seven minutes left to go you had the feeling that the clock had struck midnight for the Cinderella Patriots and the Rams would rally to win? SG: When Tebucky Jones picked up Warner’s fumble and ran it back for an apparent touchdown I told my wife that the game was over. Then when it came back I said,”Uh oh, look out now!”. When that play was wiped out a little bit of the wind came out of their sails, but they rallied nicely at the end. RRM: What happened to the Patriots in that fourth quarter when the Rams rallied for two touchdowns? Did they get a little too conservative or start to tighten up just a bit? SG: I thought the fact that they held the Rams to just three points over three quarters was pretty amazing in itself. I think the Patriots got a little bit conservative with a 14-point lead in the fourth quarter. They didn’t want to take any gambles and they sat back on the heels a bit, plus the Rams are a good football team and they are going to put points on the board. To hold one of the highest scoring offenses in NFL history to 17 points in a Super Bowl game is just an outstanding accomplishment. RRM: FOX-TV analyst John Madden curiously recommended the Patriots run out the clock with 1:30 left and no time outs remaining and take their chances in overtime. If Steve Grogan were the quarterback in that situation I don’t think he would have been thinking about taking a knee and running out the clock? SG: With 1:30 left I was thinking if they took a knee there and went to overtime and the Rams wound up winning the coin toss the Patriots would probably end up losing. I think I would have conservatively tried to see if I could get something going, and I think the coaches have a lot of confidence in the fact that Brady doesn’t make a lot of big mistakes. That’s the reason they did what they did, and once they had some initial success with the first couple of plays on that drive and got better field position they geared it up another notch and started taking a few more chances that got them into field goal range. RRM: Were you as annoyed as I was with both teams burning most of their timeouts well before the end of the respective halves? SG: What that was all about was this game turning into a chess match between Rams coach Mike Martz and Patriots coach Bill Belichick. Neither club was willing to make a mistake during the game, and they were willing to use up their time outs to make sure that didn’t happen. The Patriots would catch the Rams in a different formation than they were expecting and they’d use a timeout, and vice-versa. Every drive and even every play in this game became crucial and no one was willing to make a crucial mistake. RRM: That being said, with all their timeouts called neither team would have been able to ask for a replay of any controversial call that might have come up in the game. Was it worth it in that respect? SG: That’s true, using all the timeouts meant a team couldn’t offer a challenge to a call unless it came in the last two minutes, but sometimes you can’t afford to save them. If you don’t take a timeout and get your team into the proper alignment you want on the field and the other team scores it won’t matter if you have any timeouts left! This game was so much better officiated then the Patriots first two playoff games. The officials really let the players play in the game outside of a few pass interference calls I thought could have been overlooked. On the play where Ty Law got the touchdown on the 47-yard interception return Mike Vrabel hit Warner a lot worse than Ray Hamilton hit Ken Stabler back in that playoff game in 1976, and there wasn’t any flag. I’m sure Ben Dreith was hopping up and down in front of his television set on that play! 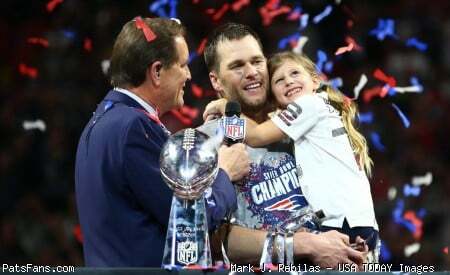 RRM: Tom Brady was named the game’s MVP for completing 16 of 27 for 145 yards and was whisked off to Disneyworld the day after the game. Would he have been your choice for MVP? SG: Well, the Patriots defense was really responsible for winning that game. There was no one player on the Patriots defense you could single out, there were just so many of them that had great games. I think Tom Brady won the MVP award on that last drive, when he led them 53 yards on nine plays with no time outs remaining. Everyone thought he would just take a knee with the ball and then see what would happen in overtime but he showed them how cool he could be in a pressure situation. RRM: Speaking of being cool, Brady actually took a nap just prior to the pregame introductions. So much for being nervous in your first Super Bowl appearance? SG: He must have been really nervous if he fell asleep just before the game! Tom Brady has been so calm and cool throughout this run, and in this game just like in all the rest he managed the game extremely well. When they got that 14-point lead and they went to their running game he took more time between snaps to run more time off the clock. You would expect a second-year player (and his first as a starter) to show some nerves in the biggest game in the world, but I didn’t see it from him at all. He’s seems like such a nice kid, and when Terry Bradshaw handed him the keys to the truck for winning the MVP award his reaction was,”Wow! You mean that’s my truck?!”. He seemed so naive about the whole thing it made it even more fun to see. RRM: Who gets the Grogan game balls for this one? SG: Ty Law deserves a game ball for his 8 tackles and interception return for a touchdown that got the Patriots on the board early. Richard Seymour made a lot of plays in this game, and he has really matured well as a player over the course of the season. I think he’s going to be a real force on this team in the future. Tebucky Jones had a couple of big hits early in the game that kind of set the tone for how the Patriots wanted to play defense. Mike Vrabel had a good game, and Troy Brown and David Patten each came up with some big catches in the game. You can’t overlook Antowain Smith who rushed for nearly 100 yards (92 for the game) and actually outgained his much-publicized counterpart Marshall Faulk. Smith got a lot of his yardage in the second half when his club was trying to control the clock and that was a big factor. I also think Grant Williams deserves a mention for filling in for Matt Light at left tackle. He had struggled early in the year and I thought he may be in trouble in this game, which would have left Brady’s backside unprotected but he held up well. Oh, and we can’t forget Adam Vinatieri, of course! RRM: What are Grogan’s grades for the climactic triumph over the mighty Rams in Super Bowl XXXVI? SG: I know I said I never give A+’s but if you win the Super Bowl I think I have to break my own rule. I’m giving A+’s across the board, and they are very well deserved. The Patriots have been called a team of destiny this last month and I know a lot of the players took offense to that, but after everything that happened and the way the game ended you have to believe there was a reason all of this happened. No one will ever be able to explain this; they did things nobody thought they could do and they wind up World Champions. I think you do have to call them a team of destiny. Next week Steve gives us his season wrap-up and his final grades for the year. Join us then! This entry was posted in Uncategorized on February 5, 2002 by Steve Grogan & R.R. Marshall.